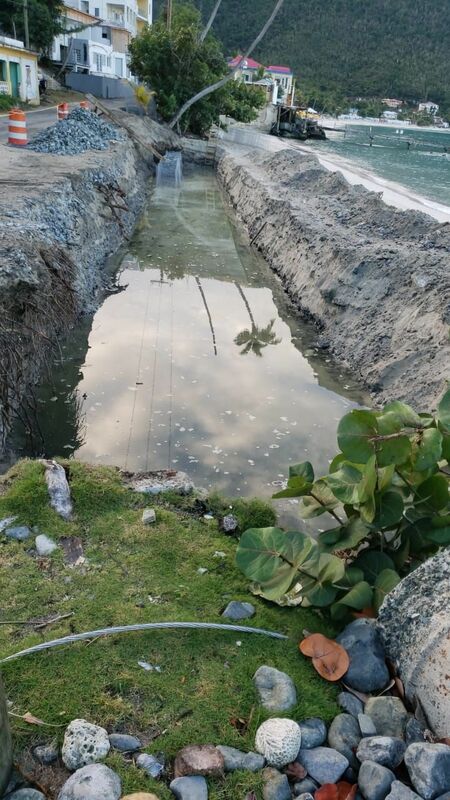 CANE GARDEN BAY, Tortola, VI - It was a story first reported by our news centre on February 6, 2019, whereby many residents and environmentalists had raised concerns about a Sea Defense Project under construction in the Cane Garden Bay area adjacent to the beach. The cost of the project is unknown, however, one of two contractors told our newsroom that he had signed a contract with the Ministry of Finance to build a wall to stop the ground sea from damaging the road. In our Virgin Islands News Online (VINO) story of February 6, 2019, we reported that both the Ministry of Natural Resources and Labour and the Town and Country Planning Department could not confirm that the project was approved by their agencies. It seems like the right hand does not know what the left hand is doing. This is emblematic of the NDP for the last 8 years. You right. God is watching all that stuff out there in the water. Only a matter of time!!! Some come to Cane Monday and Tuesday for some world class gridlock and listen to the horn honking swearing taximen. Road is down to barely one lane and traffic going to come to a standstill. Either finish the job or have contractor restore site to original condition. Roadway collapse is quite possible with the open trenches filling with seawater. Sunday taxis all down one side of road reducing it to one or no lanes!